WELCOME TO THE TREASURE STORE! Please check out the cool links below. Keep your eyes open for the new Treasures we dig up in the collection. We add new things here as quickly as we discover them. 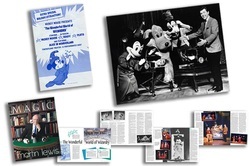 Get the full story about the FIRST ever Mickey Mouse and friends Character show! 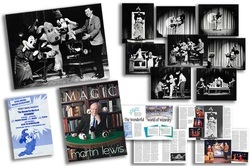 "The Wonderful World of Wizardry"
Discover what Mark Wilson and his team created for that ground breaking production in this incredible two part, 8 page article in MAGIC Magazine full of never before published photos, behind the scenes stories and full show description! Have your own issue, Autographed by Mark Wilson and author Greg Wilson! Original Mint Condition Disneyland Flyer from the show! There's even more cool stuff with the PREMIUM and MASTER COLLECTIONS! They are the ORIGINAL Flyers handed out to visitors at Disneyland in December of 1967! This is not a digital duplicate, it's the real deal, processed and developed the old-fashioned way, and stored in the Archives for all these years. 8 Presentation Photos 3.5 x 4.5! Very few Master sets are available. Get yours while we still have them! I will let you know if we are able to put together any other types of sets. I promise to dig through the collection to find anything that I can! But for now, this set is GONE! Thank you to all our Allaka-Family Supporters! 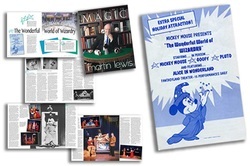 * The MAGIC Magazines are individually autographed by Mark, Nani, and Greg. Because of this each one is unique, being signed one at a time. Please understand that many variations occur in this process, which actually make each one more valuable! ** The Disneyland Flyer ad is a single sheet of paper, 5.5"x8.5", printed on both sides. 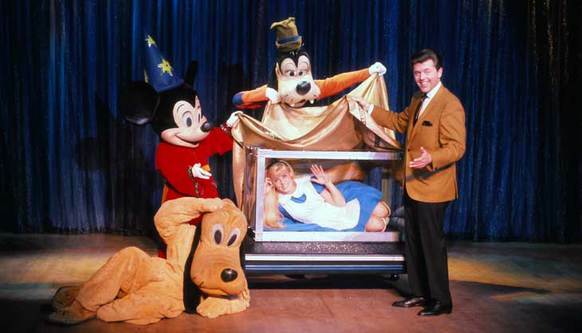 Mark secured a small stack of them from Disneyland when the show was actually happening in December of 1967. This small stack are all that remain in our Archives, and they look great! We will do our best to preserve them for you, but please understand that some normal aging can affect these Flyers as they are nearly 50 years old! Thank you for cherishing them as much as we do. *** Please remember these are Original 8x10 photographic prints from c.1967. Some normal deterioration and aging naturally occurs because of the chemicals and type of paper on which the prints are made. Please know that we pick the best of what we have to send to you. But minor wear and tear and slight discoloration is to be expected. There are actually two different yet very similar images of Mark with the Disney Characters and the Train Illusion. In one, Mark's arms are outstretched, in the other, his arms are folded. Both were printed c.1967, and are from the same collection. Since we are limited to what we found in the Archives, please understand if you receive a photo that is slightly different from the one posted above. They are in great condition, and suitable for framing! **** The Presentation Prints were made in an era before computers, Photoshop, and digital printing. They were created as 3.5"x4.5" to be hand "tipped" into Mark Wilson's Magical Productions sales presentation books. These prints are the ones that were not used and are in beautiful condition, having been stored in the Archives photo drawers ever since they were made! The ones you receive may be individual images or may still be in the "4-up" format, printed on 8x10 glossy photo paper. All are Original prints c.1967, and may have some normal deterioration and aging, as stated above for the other 8x10 prints***. They are in great condition, and suitable for framing!